I am excited to be working with Resilient Coders, a deeply impactful non-profit that is equipping young people, ages 18 to 26, with skills for careers in tech. The model has been so successful that they want to replicate the model for Dev Ops and Automation (I am sponsoring this at CTP). The demand is there. The urgent need to hire entry level employees is there. Students are interested and CloudTP is ready to hire. Help me support Resilient Coders in the launch of a Dev Ops Bootcamp in 2017. It costs $5,000 to put a student through Resilient Coders Bootcamp, which includes their stipend. That’s about a third the industry standard. Only $75,000 to run a Bootcamp that will prepare 15 young people from traditionally underserved communities for a career in tech. When they get jobs that pay $50,000+ we’ll have created $750,000 of economic value for these young people! Please be a participant in this multiplier effect. Consider a donation today. At IoT World, it was a flurry of Internet of Things’ potential and platforms paired with an overwhelming sense of confusion and questions with few answers. At the IoT World 2016 conference, there was a real sense of energy and excitement about the potential for the connected device ecosystem to change the world. Over 12,000 attendees, a packed exhibit hall and full keynote sessions highlighted the momentum that the Internet of Things is driving. As IoT grows and billions of devices need to connect to the world, one of the most critical components of future Internet of Things systems may be a device known as an “IoT gateway.” An IoT gateway aggregates sensor data, translates between sensor protocols, processes sensor data before sending it onward and more. 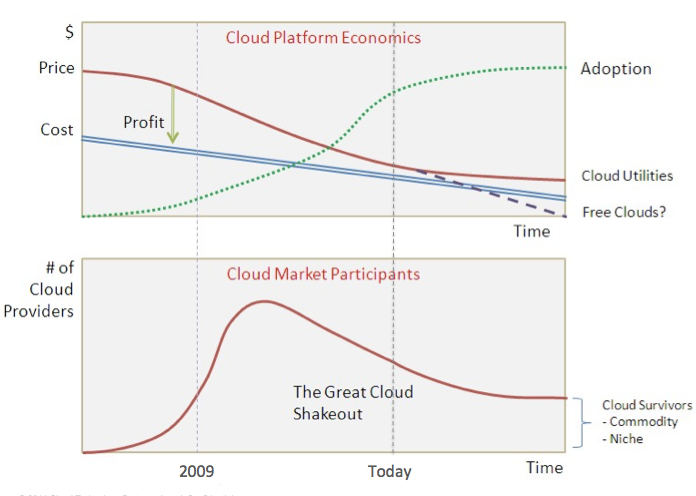 Back in 2009 I posted about the “Great Cloud Shakeout” and the coming market consolidation into a few very large clouds. Nearly 5 1/2 years later and it’s about (long past?) time I took another look to see how I did. Back then I predicted that the market would be dominated by “mega CSPs” by the name of Amazon, Google and Microsoft. Note that this was during a period of Cambrian Explosion in the CSP market – it seems like everybody in the hosting business wanted to be a cloud provider. Every telco, every hoster, every data center outsourcer, most systems providers and many, many startups are becoming CSPs. After all, there have been thousands of hosting providers over the past several years competing for your business. A few were huge, several were large, and most were small but often profitable. I’m convinced this time it might be different — the cloud provider market will be increasingly consolidated with fewer opportunities for new entrants or profit from the tier 2 or 3 CSPs. The APIs, data center economics and proprietary platforms will make cloud a much more consolidated market. … where the number of new entrants and the hyper-efficiencies gained by the biggest [providers] will result in razor thin margins that can’t be met by most of the players going forward. The pricing curve will drive adoption, solidifying the economies of scale by these mega CSPs. Over the intervening years I can happily (for me, not for most CSPs) report that my predictions were spot on. I predict that there will be many new CSPs over the next 18 months, but even before the new entrants stop coming many companies will exit the cloud business. Some exits will be via consolidation/merger, but many will just pull out of unprofitable businesses in the face of blistering competition. My take is that the great shakeout will be in full force in the 2012 time frame, with a bottom reached over the following 5-10 years. Clouds came and went, but the mega clouds from the “Big 3 Cloud Providers” continue to grow and prosper. Other cloud providers may remain and have a chance to survive – but only if they develop strong niche positions (market, capability, etc.). p.s. note also the news recently about HP coming to terms with their inability to compete with AWS in the public cloud space. The rise of cloud computing is a perfect opportunity to rethink your IT governance model in a fundamental way. Read the first part of this column for a discussion of how to reshape IT governance to add value, rather than hold a business back. Many enterprises place prohibitions on the use of Amazon Web Services (AWS), Google and other cloud services, despite the overwhelming evidence that these platforms enable innovation infinitely more than most of internal IT, and are every bit as secure as current systems — often, more secure. Rather than the five guiding principles of the COBIT framework that encourage these prohibitions, IT governance should have only one: Exceed stakeholder expectations for agility, innovation, quality and efficiency to drive business value creation. How is that done while ensuring the proper allocation of capital, the right level of risk management, and while sticking to the service-level agreements demanded by the business? By throwing away convention and being bold; by inspiring your team to let go of preconceptions and fears so they will follow you; by removing people in your team that aren’t capable of adapting to this new role of IT. An overhaul of your IT governance framework can be fun and profitable. This may sound a little far-fetched, but bear with me. The problem with the IT governance model is that the first principle is often a victim of the requisite processes and policies for the other four. This focus on how to implement the governance framework to control and reduce risk has a problem — it makes IT unwieldy and unable to meet the needs of stakeholders. The governance of IT investments is a mess, and IT governance is killing enterprise innovation, according to a Harvard Business Review report. That’s a bit heavy-handed, but the core premise of the article is correct: Far too many IT investments are tactical and not driven by value creation for the business. DevOps is an exciting and far-reaching shift in IT delivery. The promises are tempting: radically higher productivity, lower cost and more reliable systems. So I guess it’s finally time for your IT organization to get on the development-operations (DevOps) bandwagon, right? Everybody’s doing it, so don’t delay. The big question isn’t whether, but how and where do you start? First, go out and hire some DevOps people. Wait, wait — DevOps isn’t a job. Okay, so you should create a DevOps group or department, right? A great team of people you can train up on DevOps led by a director of DevOps. Hold on! DevOps isn’t a department or function either. Well, if it isn’t a role, a function or a department, what is DevOps?